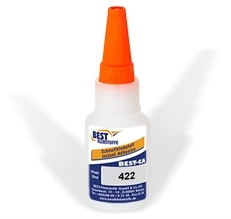 BEST-CA 422 is a one-component, solvent free cyanoacrylate adhesive based on alkoxy-ethyl-cyanoacrylate. BEST-CA 422 is the standard product for bonding of plastics, e.g. polyamide, PVC, PMMA, and various elastomeres, e.g. rubber, EPDM and viton amongst each other and with metals and ceramics. The product does not bloom and does not leave a white residue even on black materials. The product is also almost odourless. BEST-CA 422 is very fast cure. After full cure the adhesive is high strength and temperature resistant. BEST-CA 422 is ready-to-use and can be applied from the original container. 15 to 35 seconds. 85 % of final cure is reached after 30 minutes, 100% after 20 hours. The rate of cure depends on the ambient relative humidity. A relative humidity of 40 to 60% will lead to best results. Lower values may delay cure. Bonding surfaces must be dry, free of dust and grease as well as other contaminants. Sand-blasting, grinding and staining bonding surfaces will enhance adhesion on bonding surfaces. BEST-CA adhesives show good resistance to changing climatic conditions and chemical influences.